Why Choose Vianvi Signature® Cabinet Refacing ? The Vianvi name has been at the forefront of the cabinet refacing industry for over a quarter of a century. The established methods and materials used in this process are the best in the industry today and are only part of what makes Vianvi a name you can depend on. Craftsmanship and high quality standards have always been the benchmark for this family tradition of fine cabinet makers. For years, tens of thousands of happy, satisfied clients have enjoyed the exhilaration of this transformation progression. The Vianvi process affords you the appearance of new cabinetry without the inconvenience and costly delays associated with full replacement, at a fraction of the cost. 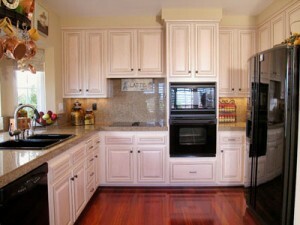 Most kitchen refacing and bathroom refacing projects are completed in as little as (3) days. The Vianvi name is your satisfaction guarantee. It affords you the luxury of knowing that even in tough economic times, your investment today will look just as beautiful tomorrow and for many years to come. Gatherings at your home will never be the same once you have experienced the pleasure of being able to share your newly transformed cabinetry with friends and family. So what are you waiting for? Come join the long list of satisfied clients who have taken the first step in changing their lives one cabinet at a time. We look forward to earning your business and we thank you for making the Vianvi name part of your family as well.